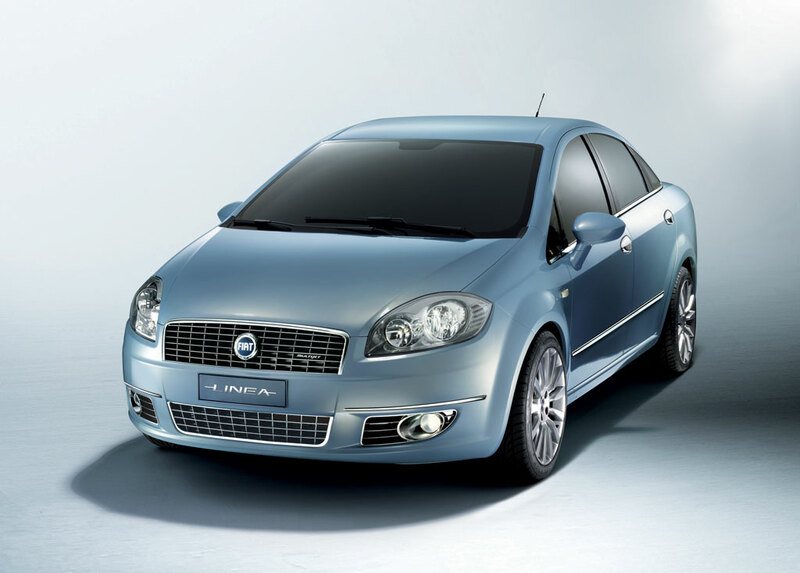 The Fiat Linea, which was present in Istanbul last October, now makes its market debut. This three-box Segment C saloon gives a new interpretation of styling, practicality and enjoyable driving, all for an extremely competitive price/contents ratio. The car was developed by Tofas A.S., the 50-50 joint venture between Fiat Auto and Koç Holding which is listed on the Istanbul Stock Exchange. It will be manufactured in the plant in Bursa, Turkey (fully operative, output will reach 60,000 units per year) and will be marketed in a number of European and non-European countries: Spain, Germany, Morocco and Finland. 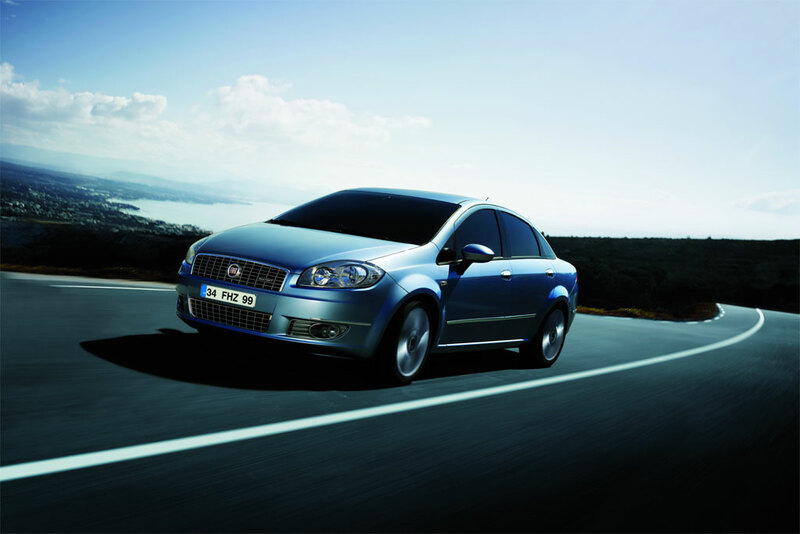 At a later date, the Fiat Linea will also be manufactured in Brazil, India, China and Russia. The new model clearly has an international vocation; it was designed by the Fiat Style Centre, and its exterior styling is elegant, dynamic and typically ‘Italian’. The aim was to appeal to the public with uncluttered, smooth lines which confirm the new Fiat family feeeling (from the Grande Punto to the new Bravo), while they offer a new reading of the stylistic elements of the great Italian motoring tradition in the saloon segment. This extraordinary stylistic heritage has now produced the Fiat Linea, a 4-door saloon that is sleek and elegant, but with generous dimensions that put it at the top of its class: it is 4.56 metres long, 1.73 metres wide, 1.5 metres tall and has a wheelbase of 2.6 metres, as well as a 500 litre luggage compartment. The same attention went into the styling of the interior, where the lines are harmonious and balance well with the exterior, creating a friendly, light-filled environment that provides an amazing amount of room and superior comfort, where ergonomics and space for the driver and passengers are concerned. 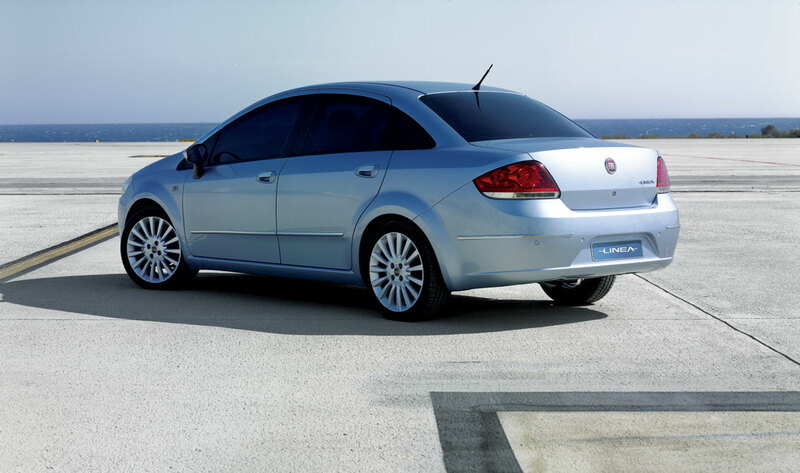 And it is in terms of the quality, comfort, practicality and enjoyment of the interior that the Fiat Linea aims to make the difference, backed up by the refinement of the materials and by the colour combinations, as well as the attention paid to every detail and to the assembly. Designed for an elegant, refined clientele with plenty of personality, the new model is agile and enjoyable to drive in all situations. It has a sparkle that is due primarily to its engines, which combine excellent performance, low consumption and absolute respect for the environment (they are all Euro 4). At the launch the model will be offered with a choice between a petrol engine (1.4 8v, 77 bhp) and a turbodiesel (1.3 Multijet 16v, 90 bhp with a variable geometry turbo), both combined with five-speed mechanical transmissions; the 120 bhp 1.4 16v Turbo from the new T-Jet family will be available at a later date. The Fiat Linea range is very comprehensive to cater for a clientele that considers cars of this class as a real investment, because it represents the family’s main car, and it will adapt to the various markets where it is sold. In most of these, at its launch, the range will offer two engines (90 bhp 1.3 Multijet and 77 bhp 1.4 16v), three specifications (Active, Dynamic and Emotion), and 11 body colours. The range also proposes equipment worthy of a higher segment, such as certain sophisticated climate and infotainment devices that improve the comfort and quality of the time spent on board: from automatic climate control, the Blue&Me® system with USB port, a radio with CD-player (including MP3 files) and Cruise Control, down to rain, dusk and parking sensors. In other words, there are endless possible combinations, all offering excellent value for money and the best price-content ratio. Finally, the Fiat Linea is equipped with a reliable suspension layout which guarantees very easy, precise steering, excellent roadholding and the best possible comfort for passengers: an independent MacPherson system at the front, and semi-independent wheels connected by a torsion axle at the rear. But the Fiat Linea is not only styling, plenty of personality, modern reliable engineering, a wealth of equipment and outstanding comfort. It is also a very safe car. Rather than the individual devices, it is the combination of the many solutions adopted that make it one of the safest cars in its segment. Stable, effective braking, good acceleration guaranteed by the engines and predictable handling, get the Fiat Linea out of even the most critical situations. The new model is also very well equipped where passive safety is concerned, a fact borne out by the presence of 6 airbags (Multistage at the front, curtain-bags and sidebags) which are standard depending on the version and the market. What is more, it also adopts a number of innovative technical elements that ensure the driver always has total control of the car (active safety). These include latest generation ABS, complete with EBD (Electronic Brake Distribution) and, optionally, the sophisticated ESP (Electronic Stability Program). These briefly are the winning features of the Fiat Linea which aims to play a leading role in this category, where all the world’s major carmakers compete. Segment C accounts for 20% of the Western European car market, in other words the core of the market, with about 3,000,000 registrations per year. However, the majority of the cars in segment C are two-box hatchbacks, while 3-box models (saloons) only account for 5% of that market, with 150,000 registrations per year (this is expected to reach 160,000 units by 2013). The share in other non-European countries is more significant. In Turkey, for example, segment C represents 52% of the whole market, and saloons account for 75% of this, with 170,000 registrations per year (approximately 50% of these are premium cars, and the sales mix is 50% petrol and 50% diesel models). 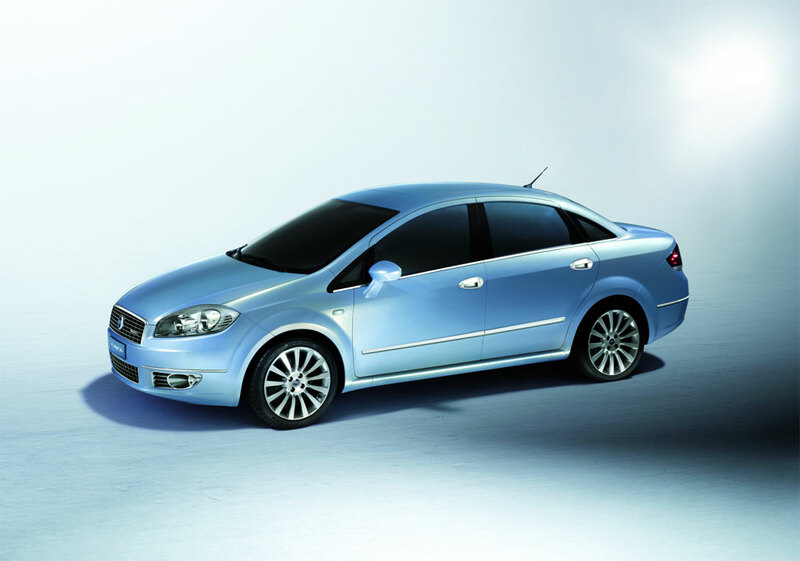 The Fiat Linea is destined to become a strategic car for the Fiat range in China: the entire Chinese market totalled 4,000,000 vehicles in 2006, and is expected to reach 7,500,000 units by 2013. And finally, in Brazil, the market absorbed 1,835,000 cars in 2006, and is expected to reach 2,250,000 units by 2013 (because the Brazilian market is structured differently, the Fiat Linea is in category D, and its goal is to achieve a 13% share of the segment). A special version will be marketed in Brazil, powered by the new 130 bhp 1.9 Flexfuel engine (running on gasohol, which already contains about 22% ethanol, and pure bio-ethanol). Bio-ethanol and gasohol are poured into the same tank, a feature that makes it easier for motorists to fill up. The engine software recognises the composition of the mix and automatically adapts the injection and ignition parameters. Flexfuel engines are able to function in the same way and with the same performance with both conventional fuels and with alcohol-based fuels. In environmental terms, the advantage of ethanol lies in the fact that it is a renewable source of energy and helps to limit emissions of greenhouse gases, because it captures carbon dioxide in the production process.